Betagende havudsigt og tropiske brise til at feje dine bekymringer væk! Fred, ro og ro, med lyden af ​​havets bølger nedenfor venter dig. Vista de Redonda tilbyder den bedste havudsigt af øen, og da det er navnet antyder, et klart overblik over Redonda, samt Nevis på klare dage. Placeret på toppen af ​​øer Bay øer, denne villa var engang hjem for mange meget berømte indspilning kunstnere og musikere fra den tid, såsom Elton John! Den Souffriere Hills vulkan, der brød ud i 1997, har lukket luft studie, og begravede den vigtigste by Plymouth, men Montserrat er i live og godt, og en forbavsende fredelig getaway destination. Vista de Redonda er i øjeblikket til leje som en meget rummelig to (2) værelses villa. Hvert værelse har eget privat badeværelse og overdådig king size seng. De to værelser er placeret i den østlige ende af villaen, som giver masser af privatliv for to par, eller en lille familie at bo på Vista. Med over 2.000 kvadratmeter overdækket boligareal tilbyder denne villa rigelig plads til at bevæge sig rundt og være inspireret af alle Montserrat har at byde på! Fred, ro og ro, med lyden af ​​havets bølger nedenfor. Isles Bay Beach er en kort 20 minutters gang væk, nu byder på en helt ny yacht club, restaurant og bar, til aften spisning og drikkevarer på stranden, og smukke solnedgange. Andre restauranter, købmand og andre faciliteter er inden for 20 minutters kørsel. Lejes på en ugentlig eller månedlig basis, Vista de Redonda har de bedste priser overalt på øen! Du vil ikke finde et større hjem med pool og bedste Montserrat og havudsigt, på sådan en overkommelig pris. Når hjem til mange optagelse kunstnere på den tid, var Vista opgivet under vulkanen år, hvilket er årsagen til den overkommelig pris. Denne rummelige ejendom er fuldt funktionel og godt møbleret, med dinning plads til op til 20 personer! Køkkenet er fyldt op med alt hvad du kan bruge til køkkengrej, du måske har brug for selv, eller for at underholde, så hvis du ikke har noget imod farve eller indretning, og er mere interesseret i en rummelig villa med rigelig plads til at bevæge sig rundt, som den bedste havudsigt overalt på øen, så er denne villa til dig til en overkommelig pris! Amazing views, very comfortable villa! house that really interfered with our comfort. us to share the dishwashing duties. Never did get the Nespresso to work. Again not an issue as there is also a coffee maker. There were some spices, cooking products, coffee, etc available which was nice. The drains in tubs are slow and may need a good cleaning) - I know from our last rental last year that this seems to be an issue at some spots. cranked it up and everything cooked eventually. realize repairing/purchasing etc is a much bigger issue than in Canada. the bedroom for the warmer/stiller nights. Was really my only wish. top or bottom and back. (This was not something I thought possible when driving up the very steep road upon arrival) Swam every day and visited some little local bar everyday, met lots of people, I think all our neighbours, I would suggest getting involved in the community to get a better feel for Montserrat. 8am Sunday mornings go to MAPS (opposite Tradewinds Real Estate) and volunteer to walk the dogs. It is a great outing and much appreciated. Truly loved it on the Island. Literally everyone, kids to seniors, are very friendly, always with a wave and a "have a great day". No vendors trying to sell, sell, sell. worth and freeze and if you really need it - take it down with you. Also groceries are very expensive - I would suggest asking locals for buying hints. Again Thanks for the use of your lovely home. Beds were very comfy!! Everything was perfect for myself, my husband and our friends! Hopefully see you next year! We are glad you enjoyed your stay, and we look forward to welcoming you again in the near future! A very good tip to bring with you what you really need as there is no guarantee it will be on the island! Thank you for your time in writing such thorough feedback! We are headed back to the island in April and will look into items you mentioned need attention. Rainbows and a lovely bottle of wine was waiting for us upon our arrival. We spent most of our time in the outdoor living space – there is a dining area, a sitting area, and of course, the pool. While there is TV in the house, it is not hooked up to cable. We should have read that more carefully. Internet is available in the main house area and on the verandah. It does kick out when you get to the pool and far bedrooms, so you just need to be aware if you are looking to conserve your data. Jerette, the property manager, met us at the airport and arranged for a rental car. He was very friendly and responsive. We did have to reach out to him several times as we had no hot water for the first several days of our stay. Neighbors made sure that the property owner was aware of the situation; we did receive a communication from her during the week, apologizing for the issues we were encountering. In all, the house and its amenities were fine, though I did expect it to be a little better equipped. There was one dish towel available and no pot holders; there were no paper towels when we arrived, no napkins, no Kleenex, no foil, no plastic wrap. We generally replace all these and then some when we go to shop mid-week, so we had to escalate our shopping schedule a bit and run to the store the day after we arrived instead of waiting a few days to restock. There was no dish strainer per se – there was a draining pad, but it was not very clean, so I was not entirely comfortable putting clean dishes on it. There are some little things that could be done to “spruce” the place up a bit; it would not take much. The upholstery on most of the cushions were stained or dirty. It would be helpful to have all the switches labelled – we played “guess which switch does what” for a couple days. The shower head in the bathroom which adjoined our bedroom did not work – the water just dribbled instead of spraying outward – so we had to use the bathroom down the hall. Some of the towel racks were coming off the wall. It would have been nice to have cushions for the pool chairs and some flotation devices. Little things would go a long way. This was our 4th time to Monsterrat. The rental price for our stay was quite reasonable, so expectations should remain reasonable as well. We did not allow any of this to ruin our stay – and it didn’t. We had a wonderful week, with a wonderful view in the peaceful environment that we were looking for. We definitely do our utmost to ensure an amazing stay. All these issues could have been addressed had we known. There are at least 10 hand towels in the drawers to the left, for instance. The pressure takes 10 seconds to get to the shower head, which only requires holding the knob for 10 seconds. 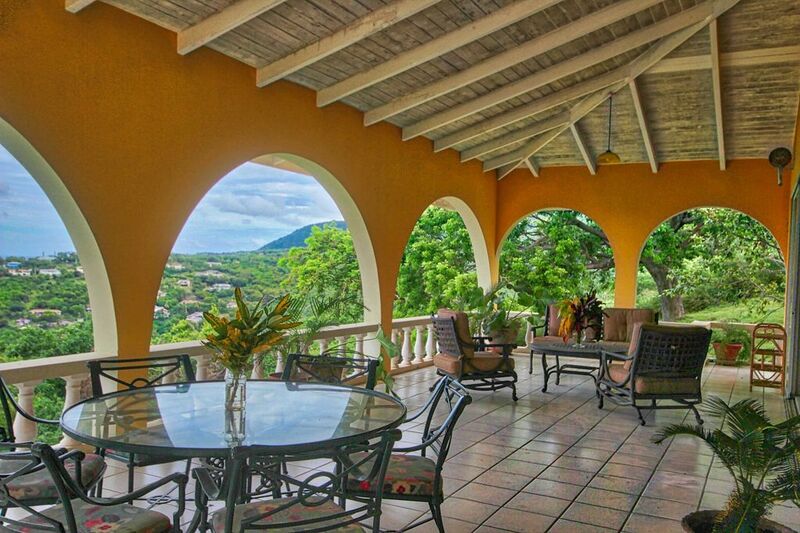 We spend 5x the money on the villa than comes in to ensure proper maintenance and functioning of all amenities. It is not for lack of trying. We keep the rental cost extremely low in consideration of the imperfections. Though again, everything mentioned here could have been remedied had we been made aware as the villa has everything mentioned and it was simply a matter of opening a door or drawer. We are glad you were able to enjoy your stay in spite of the lack of the villa. Hello! !me and my little baby stayed 12 days in this beautiful house! It is up in the hill so you can enjoy everyday a stunning ocean view and it is 20 minutes by walk from the beach and 10 min by car from the supermarket . When you get in there is a huge living room with a sliding glass door to go out in the balcony . We had any meal outside. The kitchen is fully furnished, and renewed. Every room has a queen size bed and own bathroom with bath tub. My room had a sliding glass door too...when I awaked up in the morning, open the curtain and see the ocean..I felt so happy and in peace with my self. Outside there is a swimming pool, clean and deep, with some deck chairs .And there is a laundry too. In this house you feel at home!! The owner, Marie Jose,is a lovely fantastic person, and she available to help you in anything you need. Montserrat is a fabulous island, you are surrounded by nature, not McDonald and commercial stupid stuff, just nature, animals, ocean, beach, freedom, peace,tranquility, love, and life. You can breath pure air and feel alive.